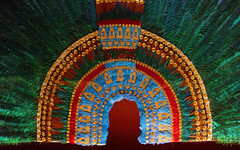 This headdress is also called the Penacho of Moctezuma II. Moctezuma II’s headdress was first mentioned in a European inventory in 1596, when it was acquired by Austrian Archduke Ferdinand II von Tyrol. It was listed there as “a Moorish hat.” It was likely an object sent from Mesoamerica to Europe by Hernan Cortes, but it is unknown whether it actually belonged to Moctezuma II himself. In the late nineteenth century, Austria established its first Museum of Natural HIstory, with geologist Ferdinand von Hochstetter as its director. While searching for objects to display in the new museum, von Hochstetter found the headdress in Ambras Castle, Archduke Ferdinand’s former residence in Innsbruck, Austria. Since then, the headdress has been displayed in the ethnology museum in Vienna (now called the Weltmuseum Wien). In 2010, the Weltmuseum embarked on a restoration and research project on the headdress in conjunction with INAH (Instituto Nacional de Antropología e Historia, Mexico’s National Institute of Anthropology and History). Despite intensifying demands to repatriate the headdress from the 1980s, [the headdress] has remained a centerpiece in the modern museum….When I encountered [the headdress in Vienna] in 2012, after a major refurbishment project at the Museum für Völkerkunde and soon before the museum was renamed the Weltmuseum, the headdress was poised at an angle of 45 degrees in another new custom- built vitrine at the centre of a special exhibition titled Penacho: Pracht & Passion (Penacho: Glory & Passion). The exhibition, which granted free access to Mexican citizens and was accompanied by a Spanish version of the catalogue, focused on the art of museum conservation and studiously avoided any reference to the by-now vociferous repatriation lobby. 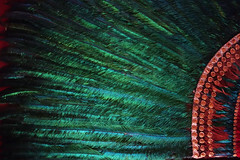 The replica of the headdress in Mexico City, which is featured in the video above, was created and installed in 1940. Cite this page as: Dr. Lauren Kilroy-Ewbank and Dr. Beth Harris, "Aztec feathered headdress," in Smarthistory, August 10, 2015, accessed April 23, 2019, https://smarthistory.org/feathered-headdress-aztec/.